Only a short trip from Cusco, Aguas Calientes plays host to one of the most spectacular wonders of the world. Machu Picchu, the ancient Incan citadel sits high above the town on the forest clad mountains and is a stunning representation of architectural ingenuity. Abandoned around the time of the Spanish Conquest, the area fell into ruin. However over recent years Peru has been reconstructing some parts of the citadel to give a better representation of how it would have originally stood. The town itself also holds a wealth of things to do from hot springs to zoos. We’ve selected the best places to stay in Aguas Calientes to use as base camp and relax in afterwards! Machu Picchu - Has to be seen to be believed! If you’re in Aguas Calientes it would be criminal not to visit these spectacular ruins. It should be noted that the site does get very crowded once the sun comes up. So, for the best experience we recommend waking up about an hour before sunrise and walking up the mountain before the buses start shuttling in the masses. There are well-trodden paths leading from the town up to the site but bring a head-torch as it’s not lit. There’ll probably be others doing the same which is helpful for navigation. Los Jardines de Mandor - A protected environmental area where you can walk, learn about the area's biodiversity and even contribute to the restoration! Hot Springs - What it says on the tin. Take a towel to the centre of town and rest your weary legs in the warm water. There are also cold plunge pools for the more macho among you. 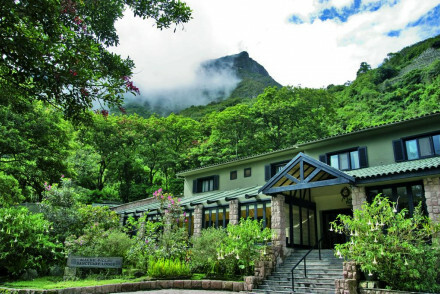 Learn about some of the natural wildlife at the Mariposario de Machupicchu, a butterfly garden featuring numerous species of beautiful butterflies. Complement your visit to Machu Picchu with a visit to Museo de Sitio Manuel Chavez Ballon - featuring a variety of artifacts and exhibits, it will undoubtedly help deepen your knowledge of this historical wonder. Machu Picchu draws visitors globally year round ensuring that the best places to stay in Aguas Calientes are extremely popular so book early to avoid disappointment! Belmond Sanctuary Lodge is an incredibly luxurious way to experience Machu Picchu. Located just outside the site’s entrance the hotel offers great views and fantastic food in a place like no other. 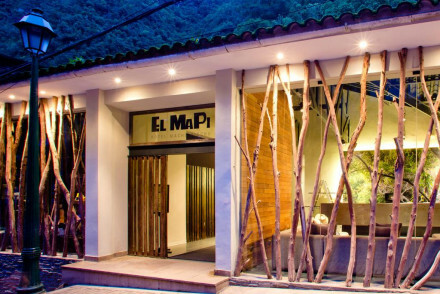 El Mapi is a stylish hotel in the center of the town. The rooms are comfortable and the food is fantastic. Also a great place for a massage at the end of a long day’s walking! 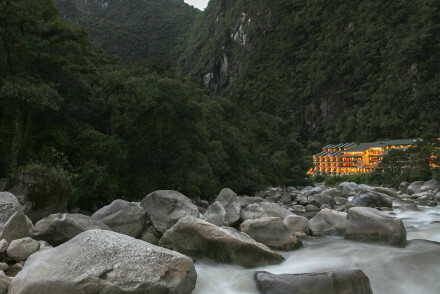 Sumaq Machu Picchu Hotel is located next to the river that runs through Aguas Calientes. Traditional decoration within contemporary architecture the hotel offers luxurious accommodation and an Andean-Asian fusion restaurant. Inkaterra Machu Picchu Pueblo Hotel sits at the edge of the town and is a great example of the best of Peruvian architecture. Traditional buildings house cosy areas to relax in, beautifully decorated rooms with working fireplaces and a renowned restaurant. Fly to Alejandro Velasco Astete International Airport in Cusco, approximately 4 hours by rail from Aguas Calientes with both domestic and international connections. One of the most popular ways to reach Aguas Calientes is by rail, and from Cusco, visitors must travel to either Poroy or Ollantaytambo Train Station to get an onward connection to the town. Best time to visit - the temperature is relatively stable year round and hovers around 30 degrees. Being a tropical environment, rain is quite common but for the least chance of it, aim to visit between May and August. Note that rainclouds will also obscure views from Machu Picchu. Also note that February is when the most rainfall occurs, and during this month the Inca Trail is closed for maintenance. This stylish contemporary hotel is situated in the heart of Machu Picchu town. It boasts smart rooms with large windows and black out curtains whilst the food on offer is simply excellent. Treat yourself to a massage after an afternoon outside hiking for the perfect end to the day! A top-notch spot. A beautiful setting at the foot of the sanctuary of Machu Picchu, close to the Vilcanota River. Rich Peruvian colours create a welcoming interior echoed in the rooms giving a sumptuous feeling of luxury. Delicate Andean & Asian flavours influence the cuisine to great effect. A memorable stay. Sights nearby - Inca ruins, The sun temple and The temple of the three windows. Views - Fabulous views not only of the Andean mountains but also of ancient ruins. Great walks - Amazing views, make sure you are acclimatized. Cooking classes - Culinary demonstrations & mini-chef classes. A charming lodge located just half an hour to Machu Picchu. Atmospheric rooms are complete with working fireplaces, exposed beams, tartan fabrics and warm lighting. A cosy lounge is the ideal spot to unwind with an evening tipple. Gorge on regional dishes and sip Peruvian wines. Superb. Active Holiday - One of the best hotel's in the town closest to Machu Picchu complete with excellent guides. Sights nearby - The knowledgeable guides give the best experience of Machu Picchu Historical Sanctuary. Birdwatching - Up to 214 bird species including the golden-headed quetzal. Outstanding location - Beautiful riverside setting. 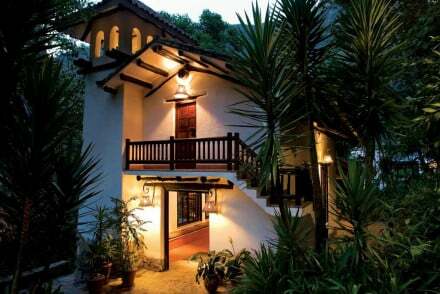 A chic boutique property with an unbeatable location right at the entrance to Machu Picchu. Charming rooms are simply styled with contemporary artwork contrasting against the white washed background and pretty terraces boast spectacular views. The cuisine is fantastic too. A winning combination. Active Holiday - The only hotel at the entrance of Machu Picchu. Local markets - Search for artefacts at the lively central market in Cusco. Sights nearby - Take a guided tour of the Inca citadel.